I feel like every time I flip on the news there’s a new credit card fraud being reported. Honestly, it makes me feel like none of my personal information is safe anymore! Two years ago I would never have guessed that two of the largest retail stores (Target and The Home Depot) would experience the biggest credit card data hacks to date. 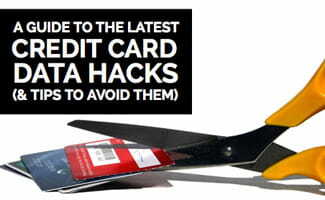 Read further to learn the details on these recent credit card data breaches. We aren’t even two months into 2015 and people are already calling 2015 the year of the hack. As of February 10, there have already been 80 data breaches affecting more than 80 million people. To learn more about these data breaches check out this report from the Identity Theft Resource Center. Want to learn more about credit card fraud news? Click one of the companies below to learn the details of the credit card theft activity associated with each. We plan to keep this article updated as new identity theft incidents occur. How Can I Prevent Credit Card Theft? It’s important to protect your identity. That means covering all your bases and also covering the keypad while entering your pin number on a credit card machine. You should also be wary of any ATM or credit card processing machine that looks like it has been tampered with. In addition, pay close attention if you hand your credit or debit card to a cashier to make sure they aren’t swiping through a “skimmer” (a device that is used to steal your account information). Finally, you should consider an identity theft protection service. An identity theft protection service provides you the tools to help protect your identity from being stolen. You pay a fee for a company to notify you when your personal information is used to apply for a line of credit, open a bank account or sees some other form of fraudulent activity with your personal information. If you’d like to learn more about identity theft protection providers check out this comparison article. We’ve ranked the top providers and even created a comparison table to help you find the best service for you. The Home Depot’s payment processing system was breached in 2014. Customers who made purchases from April 2014 – September 2014 were at risk. Hackers obtained 56 million customers’ credit card information and as a result, The Home Depot offered the affected customers a free year of identity theft protection from AllClear ID. In 2013, the same malware that attacked Target’s system also attacked Neiman-Marcus. Neiman-Marcus offered the 1.1 million customers affected 1 free year of credit monitoring. Target, one of the largest retailers in the U.S., had a credit card breach during its busiest holiday shopping time, November to December 2013. About 40 million customers had their credit/debit card information, names, addresses, phone numbers and email addresses stolen. All customers who shopped during that time were offered a free year of Protect My ID. In 2012, more than 38 million users had their debit/credit card records stolen. Attackers also obtained access to users’ Adobe IDs and encrypted passwords. Originally, Adobe thought only 3 million users had their information stolen, but after time and research passed they found that more than 38 million people were effected. In late 2013, it was reported that more than 100 banks and financial institutions in 30 countries were effected by a security breach involving malware installed in bank’s internal computer systems. Kaspersky Labs, who has been conducting the investigation, estimates upwards of $300 million was lost in the breach and has yet to determine who is responsible for the sophisticated hacking which included impersonating bank tellers and transferring large sums of money to outside bank accounts. Read more about the bank hacking report in the New York Times. Due to privacy reasons, they will not release the names of the financial institutions effected, but the targets were primarily in Russia. Can Banks and Retailers Prevent Credit Card Fraud? Some banks and credit card companies are now issuing EMV cards. EMV stands for Europay, MasterCard and Visa. These cards have a chip in them that gives point of sale terminals and ATMs the ability to authenticate that credit/debit transaction. Learn more in this video. If you are a modern shopper, you probably shopped at one of the stores listed above potentially putting your identity at risk. We urge that you look into getting identity theft protection to help you stay safe. According to data from the Nilson Report, the United States is responsible for 27% of the credit card transactions in the world, but is responsible for a whopping 47% of credit/debit card fraud. With today’s online shopping trends and the increasing number of online transactions, it’s important that you protect your identity. Have you been a victim of identity theft? We’d love to hear your story.